It’s a fun headline. If my timeline on Twitter is any indication, headlines like this one get a lot of traffic when posted on popular marketing blogs. The perceived complexity of SEO drives up the level of interest for many business owners. Today I’d like to advocate for something different: making your approach to search marketing simpler. Instead of using thousands of research papers from Google and Stanford to explain how SEO works, I’d like to break down the often confusing jargon of how to do SEO into three primary pillars. These key areas all have a key relevance to how any website ranks well in Google and best of all they’re fairly future proof. Websites using these concepts in 2010 would be ranking well. Website using these concepts today will rank. And, I am confident websites using these tactics in 2025 will be ranking too. Before we take a look at the first pillar of the framework, I’d like to take a moment to discuss something important to your success. Simple doesn’t mean easy. And, while the concepts in the framework are simple, they’re not “easy work”. This isn’t something you can knock out in a weekend or even a month. It takes consistent effort over time. Amazon aims to deliver millions of packages in 2 days (often less) to their Prime customers. Why? They’ve found that customers love when their packages arrive quickly. A simple concept: packages delivered quickly. But one that’s very hard to execute. While we are not shipping packages today, instead we are talking about executing on a marketing campaign against companies with million-dollar budgets. They’ll likely be able to “outspend” and “outrank” you in many cases. However, that doesn’t actually mean that you can’t be successful. Your bar for success is vastly different in terms of traffic and conversions compared to, say, HomeAway. (Sidebar: HomeAway isn’t doing so good lately either…see my latest ​post). Let’s say that you start to earn 2,500 visitors a month from Google organically. If you’re reading this it’s incredibly likely that you don’t need to scale and drive 25,000 visitors per month to turn those views into leads and bookings. You need to fill your own pipeline with interested leads and book them into your rentals with a smaller amount of traffic that converts. That’s the goal. To summarize: this is going to take work. It’s also going to take time (both in terms of effort and in terms of patience). But, done properly, you will see success. My ultimate goal with sharing this framework with you is to cut out the long learning curve and get right down to the things that’ll prove to drive more organic search traffic. That doesn’t mean you rank #1 overnight. It doesn’t mean that you get more traffic than a big listing site. It does mean that you get leads and direct bookings from your own website. Over the past 5 years, I’ve had the great pleasure to work with over 60 different vacation rental managers and professionals. You can imagine the amount of data that you can sift through once you gain access to nearly 100 Google Analytics profiles for vacation rental businesses! Analyzing that data has lead me to a very straightforward conclusion: search marketing (specifically organic search traffic) often has the highest conversion rate and the highest volume of potential guests that convert into bookings. Nearly all of the most successful vacation rental professionals & managers get the majority of traffic to their websites (and therefore direct bookings) through organic search traffic. Although there may be 200 (or 2,000) ways to get traffic to your website, there’s one that sticks out above the rest: a guest clicking to your website from an organic search on Google.com. Don’t just take my word for it: the big listing sites know this too. Check out the SimilarWeb data​ for HomeAway1 and VRBO2: the highest portion of their non-direct website traffic is through organic search traffic. Every listing site spends millions if not tens of millions of dollars with Google AdWords each month too. Do you think they would do that if that traffic from Google wasn’t highly valuable? The same holds for Airbnb, TripAdvisor and almost every listing site that’s generating meaningful traffic. Let’s start with T: technical. The technical part of the TLC Framework describes how our website is understood for both people and search engines. You can be perfect. No, you can’t. For fun, run the average #1 ranked landing page from any top-ranking vacation rental website through a free “SEO Audit” tool and you’ll find all sorts of technical mishaps. That’s not to say that you don’t want to seek to have a sound website, but the idea that Google only ranks “perfect” websites is not true. You want to focus on the important areas of technical SEO without getting bogged down trying to trim 2kb off every single image. More from Ian Lurie here on Distance From Perfect, a favorite post of mine. Lots of advice is correct, but ​it doesn't apply to you. I once had an hour-long meeting where the latest Google News protocol was the topic… for a vacation rental management company that cannot get added to Google News. The truth of the matter is that probably around 90% of the articles on the popular search marketing news websites don’t apply to your website or your vacation rental business. ​This is not meant to dissuade you from reading and learning, but know what applies to you and discard the rest. Just In Time Learning applies here -- if something doesn’t apply to you, learn about it when it does. ​Technical is all that matters. ​As we’ll learn in the latter part of the L framework, it’s just not true. You can’t get too bogged down perfecting the technical part of your site such that you have no time to create content and build links. A perfect site that has nothing on it and that no one links to is… almost useless! Now that we’ve helped by busting a few myths, we can break down the technical makeup of any website into a few specific subcategories. These subcategories are critical to seeing success: consider them the foundation of the framework and key to start with to see success. Indexing: the ability for Google to crawl and save your website content on their servers. 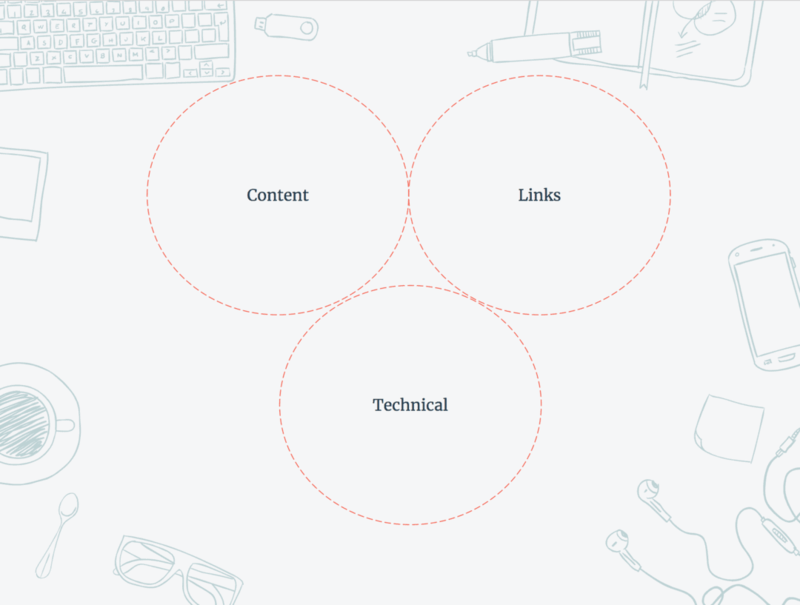 Site Structure: how we organize the website content to include important information and pages in an easy-to-understand way for both users and Google. Internal Links: how we guide both users and bots from page to page through the use of cross-linking from page A to page B and so on. XML & HTML: formatting page code (the underlying “guts” of your website) and sitemap.xml documents to explain the page content itself, the structure of the website and which pages should be shown in search results. Page Quality & Speed: the experience of accessing your website as a user or a bot: is it fast & easy to read/understand? While analyzing each of these items in great detail may be beyond the scope of this post, the good news is that there’s a myriad of useful tools that can help you understand if your website is technically sound. You don’t need to be a technical wizard to make sure your website is following technical SEO best practices. To nail down the first pillar in the framework, the underlying base of your website needs to be solid. My personal favorite tool to use for analyzing a website’s technical SEO soundness is Screaming Frog. Screaming Frog will “crawl” your website in the same way that Google does and generate reports based on technical errors like incorrect page titles, missing meta descriptions, broken internal links, too-large images that slow down the load time and a ton more. A friend once told me that doing a SEO review with Screaming Frog is the same thing as going to math class with a calculator: it’s very helpful! Other SEO technical audit crawling options include: Ahrefs Site Audit, Sitebulb (I’ve been testing & am very pleased) and Semrush Audit Tool. Sitebulb in particular can use their hints feature to show you which issues are the highest priority as you review a list of issues. The next leg of our journey starts with L: Links. Links, despite Google’s long standing battle with those who seek to abuse the ranking algorithm, remain one of the best signals that they have to evaluate website quality. Think of (real, high-quality) links like coins in a video game: the more you have, the more power you can yield. Links let you move up the ladder and rank for more competitive search terms with your existing content and website. There’s both good news and bad news as we talk more about links. Wearing the Mythbusters hat again, let’s bust some more myths! I need more links than the listing sites. Nope, not at all! In fact, it’s literally impossible that any single owner or vacation rental manager will ever have more (good) links than VRBO, HomeAway or Airbnb. Now, the good news: you don’t need to. Google ranks pages based on all sorts of link factors: the fact that you likely have a homepage targeting the main term while big sites just have a subpage matters big time. Link building is scammy/I’ll get a penalty. Sadly the practices of many who claim to do link building is one that can be quite misleading and scammy. That’s unfortunate as it makes legitimate website promotion harder, but the truth is that there are two classes of tactics: both white-hat and blackhat. I’d never recommend you use blackhat link building practices if you actually care about the long-term viability of your website and business. Google hates link building. They may, but the truth is that they rely on these signals to rank websites. Do this the right way and Google will actually love you. As you think about your destination, understand that Google aims to show websites in the search results that are the best fit for users of their search engine. That’s what keeps people coming back and what makes Google money (while many clicks go to the “free” organic search results, Google knows that many users click on both organic and paid search results). Being the best result is about doing the Technical (T) and Content (C) at a high level, no doubt. However Google can’t just base their rankings off of on-site factors. They rely on mentions (a.k.a: links) of your website around the web to not just show that they think your website is good, but others do too! Relevant and related businesses. Building links can start in perhaps the most old fashioned marketing tactic: asking your trusted friends for help. If you consistently recommend, for example, a restaurant to your guests… why not try to leverage that relationship into a mention/link? Mentions on existing blog posts and content. While you can always start by emailing and contacting dozens if not hundreds of website owners, cold email doesn't always have the best success rate. What often can be a quicker path to getting links from other websites is seeing where you’ve already been mentioned and confirming a link is already in place. If not? A quick email goes a long way to restoring the link you earned. Being newsworthy. Our personal relationships and referrals can only go so far - you need to have something newsworthy to help drive even more links to your website over time. This could be something as small as a writeup and link in the local paper for a charity you support or a campaign as extensive as working with travel bloggers staying in your rentals. The goal of being newsworthy is to take media coverage and make sure you get a link. Where your competition is being mentioned. While I never advocate this being your only strategy, the truth is that it can work very well. If you see a local competitor that’s getting lots of website traffic, see how they’re getting links! Put their website domain into a link research tool like Majestic or Ahrefs to how their mentions are earning them high-quality links. It’s very likely that there are pages out there that mention six of your local competitors… but they don’t mention you! A quick email can earn links from pages like these. Link building is absolutely an ongoing project: while you may not have the resources to get hundreds of mentions each and every week or month, you can grow your authority over time. The best websites have been building their link profile and site authority over many, many years. This is where you can see compounding benefits from your efforts. A link you get today can often send referral traffic for years to come! You should aim to always grow your link profile with legitimate efforts from real websites. Cheating the system with spam is a very quick way to burn your domain in the eyes of Google: it’s very risky and can lead to problems. Best to do it right - you’ll see better results and you don’t have to worry about your site traffic crashing and burning after the next Google algo update. Let me tell you this from experience: you can’t rank in Google without content. A beautifully designed website without any words on it won’t rank for a thing. It’s the digital equivalent of a restaurant without a door. The good news is that we can bust some myths about content to hopefully make your content-building process a lot easier. You don’t have to “publish every day” to succeed. I personally have almost never seen short micro content win over the long term over in-depth blog posts and content guides. There’s no need to keyword stuff. While on-page SEO best practices do change from time to time, in today’s environment there is simply no need to keyword stuff a piece of content thinking that’ll boost rankings. Write useful information that your guests will love: that puts you on the right track to succeed. Covering a topic once is almost always better. As you build content for your website, no need to write 7 posts about “The Best Restaurants in CITY”. Once is good - so let’s do it right! Quality and in-depth information is what users and Google want to see. While covering an entire content marketing strategy is also likely its own post, the truth is that in-depth content matters for ranking for specific topics that guests may research. My favorite tip for filling your content calendar pipeline with lots of highly relevant pieces of information is to just use Google’s Autocomplete feature. Go to Google.com and search for the name of your destination. Begin by just typing in 'AREA NAME things to do' and scroll to the bottom. ​Searching for attractions and things to do will lead you down a nice click path. Search again with some refinement: the `beach activities in miami` keyword looks good to me and scroll again to the bottom. Without paying for any high-end tools, you can likely nail down 30 - 50 topics in less than 30 minutes using this simple Google suggestions topic research. However, if you’d like to analyze your topics with more detail, third-party tools can often speed up your workflow considerably. Once you have a list of 20~ ideas, you can paste these ideas into the Ahrefs Keyword Explorer and review data like the monthly search volume for each term, the difficulty of ranking for that keyword and a ton more information. In-depth: writing a guide about things to do in your destination means you’re competing with lots of other similar content on the web about that same topic. You’ll want to stand out with useful and in-depth information. A 300 word piece about 2 of your favorite attractions likely won’t ever drive meaningful traffic. Easy To Understand & Read: content that’s hard to read won’t keep any potential guests attention. A “wall of text” is intimidating and not welcoming. Structure your content for success: high-quality (ideally custom to you) images, plenty of paragraphs and line breaks and readable text. Tells A Story About Your Destination: It’s likely that you have one major asset that even the biggest brands in travel don’t have: a story about your destination! If you can communicate what’s unique about each topic with a unique story, you’ll stick out from the crowd. While not every consideration above is a “ranking factor”, all of these pieces weave together to make your content more likely to get read and attract guests. Hopefully you’ve seen the path to SEO success doesn’t have to be littered with unread blog posts touting “938 Point Checklists” to rank. These three pillars: Technical, Content, and Links can drive you to the top of Google with the right, consistent effort over time. It’s not easy or quick, but the rewards will help you drive more “ready to book” guests to your website through Google search. I truly believe that focusing on the TLC areas of SEO is the best way to see success. I’ve refactored all of my current SEO strategies to fit into these three areas since the start of 2018. From now on, everything that I write on my site or as a VRMB Fellow in the IC will follow this framework. Remember: while 200 ranking factors may be empirically true, it doesn’t help you build your traffic and bookings. The biggest problem I see with many vacation rental business owners approaching SEO is information overload. My goal is to solve the overwhelm and let you focus on what makes the biggest impact. Questions? I’ll be in the comments to answer anything you have.